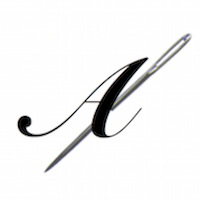 It's my blog anniversary this week.. 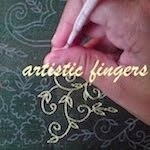 When I started blogging I was not sure whether I'll be able fill this space with some pretty decent pictures,articles etc and wondered will there be someone interested to read whatever I scribble about my stitching life ..
Leave your comment before 4:00 pm IST on October 5th. I'll draw a winner at random and announce it here on October 5th,Sunday. I hadn't touched the iris project for almost 6 months now :-( . So my little goal for this past week was to spend a couple of hours of my personal stitching time on this lovely project. 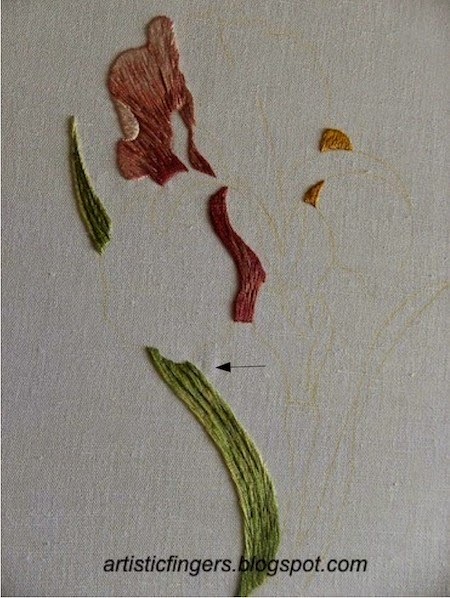 The leaf is stitched with long and short stitch using five shades of green and a darker green is used to do the stem stitch veins.Did you notice the puckering of the fabric near the leaf? I think I had pulled a couple of stitches at the top and the fabric has puckered slightly (see the arrow) *sigh*. I do hope that it will go away while blocking.. This Iris is a RSN pattern stitched by Debra Barrett.